Dove Daily Moisture Light. Many of us will do anything to get the appearance of fuller hair. We try different tactics, like blow-drying it upside down or setting it in big rollers, which helps us create the volume our hair craves but not the moisture it needs. But what if you didn’t have to choose between volume and moisture for your fine, flat hair? We created a truly advanced formulation: Dove Daily Moisture Light Shampoo, made with Oxyfusion ingredients, to help give you naturally bouncy hair that’s smooth and moisturised. Perfect for: Giving fine, limp hair volume, get the moisture you need with the volume you want. 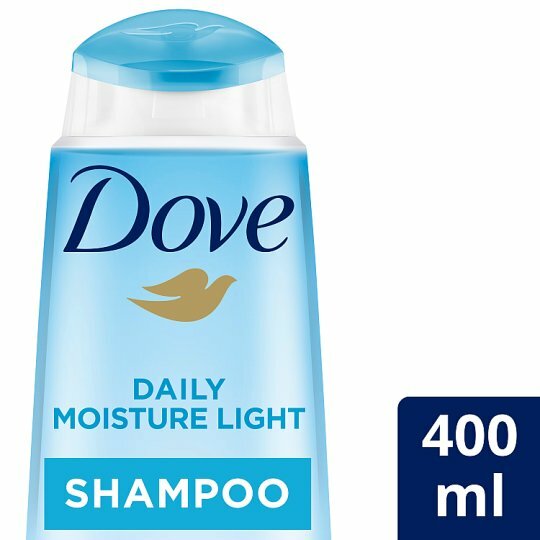 Used with our conditioner, our Dove Daily Moisture Light Shampoo helps to leave hair with even more volume. Moisturising fine, flat hair. With Oxyfusion technology, it helps moisturise the most dried out parts of the hair so, paired with Dove Daily Moisture Light Conditioner, your hair is left silky and smooth without weighing it down. Daily use, it’s so gentle, you can use this every day. How to use: Once you’ve soaked your hair with water, massage your shampoo into your scalp. Rinse well. You can repeat this step if you want, but for daily shampooing the rinse and repeat rule isn’t really necessary (unless you’ve been hitting the hairspray hard, that is).